This is a summer to remember, and I use the present tense advisedly. I am typing this whilst sitting under a veranda in a village suburb just southwest of Chania in Crete. Whilst many of my friends and colleagues are battling with new terms and the likely shortfall in the number of available exercise books, I have been seeing the azure blue of the Mediterranean for the first time. This really is a summer extension. We left England with temperatures dropping to the teens and now I’m relishing the warm breeze and high twenties for an extra week. I shall do my utmost not to inspire such dread when son-in-law thinks of me…but I do confess that in my slightly emotional state as I entered the church, I did totally forget to greet him, walking straight past in order to give his Mum a hug! I hope he has forgiven me; indeed (and I know I’m biased but…) the sight of my beautiful girl coming down the aisle on the arm of her Dad was enough to banish anything other than love from any of our hearts. And whilst they have been honeymooning in Cape Verde, I have been totally amazed at how tired a human being can be. Hubby and I got back home exhausted and overwhelmed and wanting to speak of nothing other than the wedding. It was a perfect day, but surely they don’t exist?! To us, it was wonderful and we were reluctant to move beyond it to a reality that seemed less vital. So we were glad to have booked this late summer holiday. We have used Crete to re-charge our batteries and realign our brains to something other than wedding-central. Today is unusual for us. We have decided to ignore all the beaches, coves, towns, villages and antiquities out there and stay put. We are reading, playing keepy-uppies in the pool (minus child one…sad times) and basking in the sunshine. We are, for the first time in weeks, drawing breath. I like it. The holiday has also been a blissful time of reading. I completed The Imposter by Javier Cercas on the three-hour flight, finished The Island by Victoria Hislop by the pool a couple of days ago and today, sitting with my feet dangling in what-I-confess-to-be freezing pool water, I relished the ending of Ayobami Adebayo’s Stay With Me. Hubby and child 2 have predicted that I might complete three books in addition to the one completed on the plane. I aim to please! But before I launch into my next tome, I am compelled to write about those just finished. The first one is a Warwick Uni reading list title for the non-fiction course. I confess that after initial enthusiasm for the style and personality of the author, I found the Spanish historical detail a bit too dense to hold my complete interest for the whole book. That said, it was fascinating to read a non-fiction text (or novel without fiction as he terms it throughout) where the authorial voice is as significant as that which he reports. He used the book to study the deception of Enrich Marco, and whilst this is fascinating in and of itself, he also uses the process to evaluate his own legitimacy as a writer and perhaps even as a human being. He considers how far a writer and novelist can be compared to a liar. He suffers qualms of conscience as he wonders whether an author is as guilty of mass deception as a fraudster. This is interesting but perhaps not as relevant as he makes it. In places, the book is too much about him and not enough about Marco. A novelist has permission to imagine, to push the boundaries of belief and invent characters and situations. Marco did not. Instead he invented a past for himself that gave him a platform in various public roles. And though his public work was done largely for the greater good, he did it all off the back of a lie. He had not been a resistance fighter in the time of Franco, he had not been exiled from Spain for his politics and he had never been incarcerated in a concentration camp by the Nazis. No matter what the end- result of his lies, it cannot be denied that he traded on the sufferings and persecutions of others to give himself a story. As I intimated before, this is not an easy read, but he is a figure worth reading about. You then however, face the dilemma of continuing his deceptive legacy, giving airtime to a voice that many believe should be punished by silence rather than speculation. My next read was an easy one. I had read The Island before and enjoyed it. Written by Victoria Hislop, it centres on the history of Spinalonga, a Venetian fortress island off the coast of Northern Crete. Although it is several hours away from where we are staying, I always like to read a novel set where I am on holiday, and after the past few weeks, I needed a comfort-read that I knew I would relax with and enjoy. It has been published for several years and won the Richard and Judy book club award in 2006 so many of you will no doubt have read it and not require another review. So I’ll keep it brief. Alexis is a young woman who travels to Crete with permission from her Cretan mother to discover a past that she has never divulged to her daughter. It is a past that she feels ashamed of, but which Fotina, the elderly woman who reveals her mother’s story to Alexis, weaves with compassion and integrity. Beginning with her Grandmother’s generation, we learn of the leper colony at Spinalonga and Eleni’s incarceration there following her diagnosis. Her husband supplies the island with goods on his little fishing vessel and thus keeps in touch. Her death is inevitable and painful, and so Georgios begins the task of bringing up his daughters without his wife’s advice. The novel follows this trajectory, exploring the different choices made by his two daughters, Anna and Maria. This is a story of hope and the story of a family. It also has as its background a significant part of Cretan history as the novel spans the Nazi invasion in World War 2 and the resistance of local men and women to German occupation. As I read this on a beach, a balcony and poolside, it was lovely to be able to relate to the distances between Chania, Rethymno, Iraklion and Plaka. As Alexis made the coastal road journey to Plaka, she took the same road we had just navigated during our day trip to Knossos. Novels open our eyes and make places make sense, but being here and borrowing its context for a week made the book a more relevant and compelling read. 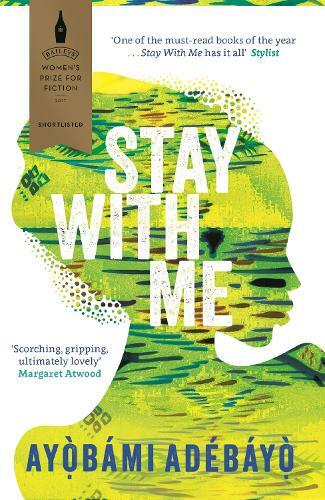 My final read was Stay With Me by Ayobami Adebayo. This is her debut novel and I think she will quickly become known as another great Nigerian writer. This is literary fiction in that it is well-crafted and intelligent, unafraid to make demands on the reader at times as the narrative voice switches irregularly between Yejide and Akin. It is at heart a love story, but instead of romance, it details the hard decisions that go hand-in-hand with choosing to love someone. There are lies and deceit in this novel, some that can be excused whilst others appal. Many of these are justified by their conformity to traditional Nigerian culture. There is pressure to marry and more pressure to bear children. And here is the mainstay of the plot. Yejide longs for a child and spends many years failing to conceive. Despite the dual narrative voices, she is undoubtedly the protagonist and the reader is wholly empathetic with her to the end. Yejide is a daughter brought up without a mother, and her father’s other wives work together to shun her and let her know that she, despite being her father’s first wife’s child, is not equal to their offspring. In a heart-breaking recollection reasonably late in the novel, she recounts how the other mothers gathered their children at night to tell them stories, taking them into rooms with doors shut and barred to her. She would move steadily from door to door, working out which story she could hear the most clearly. There she would sit, deprived of storytime but imbibing those told to other children. This loneliness is dispelled when she and Akin fall in love. He promises to fill the gaps of her childhood. But to be childless becomes a burden bigger than being motherless and this novel explores the searching heartache of a barren marriage. The cultural background is significant: Nigerian in-laws exert pressure on the couple and urge them to take part in ceremonies and rituals. A modern couple, they put more faith in hospitals and medicine, but neither route creates happiness. Their lives become increasingly complex and the narrative is compelling. I don’t want to go further into the story because I really want you to read this for yourselves. Adebayo is a strong new voice in literature and she writes convincingly, enabling readers to understand the story from multiple viewpoints. Read this book. I’m now beginning Drown by Junot Diaz, a Pulitzer prizewinner. This is part of the required reading for the fiction part of my MA course due to start in just under three weeks. It is hard to be terrified as I sit in a garden with pomegranates and grapes ripening below a Cretan sun. The banana plant waves its luscious vibrant green leaves in the breeze and I sense our local taverna may be calling me for a last sample of its delicious fare. There is plenty of time yet to get nervous and feel out of place. For now, I am quiet and still and there remains a reasonable pile of books for me to read in this rather beautiful place. I will push any concerns to one side and enjoy the indulgence of this late summer break.